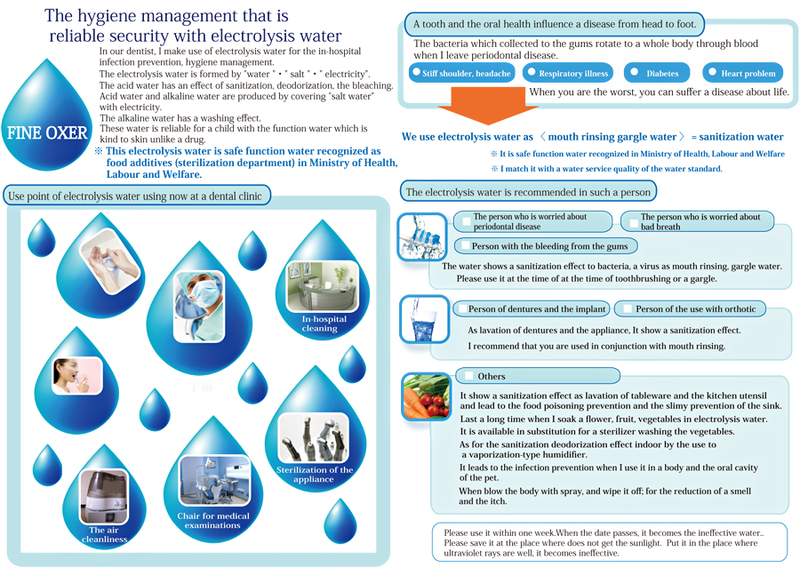 At EGDC, we use electrolysis water for the in-hospital infection prevention and hygiene management. The water is reliable for children with the function water which is gentle to skin unlike drugs. food additives (sterilization department) by Ministry of Health, Labour and Welfare. 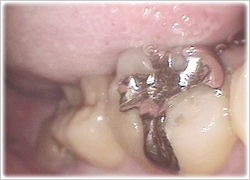 It is the sterilized water to kill not only dental caries, periodontal bacteria but the virus in about 30 seconds. And it is very safe in case of drink by mistake so that Tokyo Disenyland decided using it. 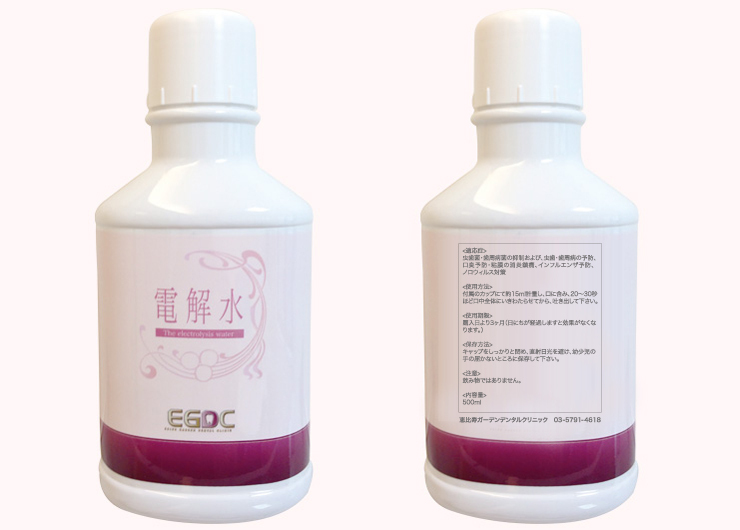 EGDC provides it as a mouthwash before treatment and prevention care. And it is also on sale here at EGDC. EGDC provide you the Scandinavian prevention system from the beginning. Because, Sweden is the only country achieved 25 teeth at the age of 80. It's impossible for anyone to keep good oral health without regular professional cares. Our dental hygienists keep your mouth clean and beautiful so that you can enjoy the comfortable dietary life and bright smile. 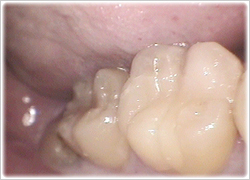 There are two steps mainly to be successful in dental treatment. 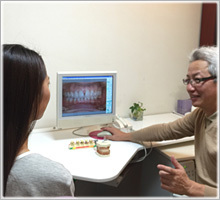 The first step is the dental examination and diagnosis, and the second step is the counseling to reach an agreement. We will take enough time for explanation about the treatment options in detail. 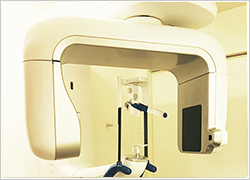 We have the digital panorama x-ray and dental x-ray system. The exposed dosage is one tenth of analog x-ray system. 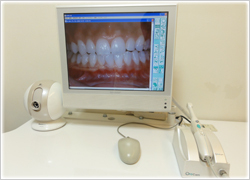 We can show the photos before and after treatment by using CCD camera. This will enable you to understand the whole process easily. It's well known these days that metal as paradium causes metal allergy. We use the metal-free materials,light cured resin and ceramics where possible. NV microlaser treatments offer you a painless dental care and cure. 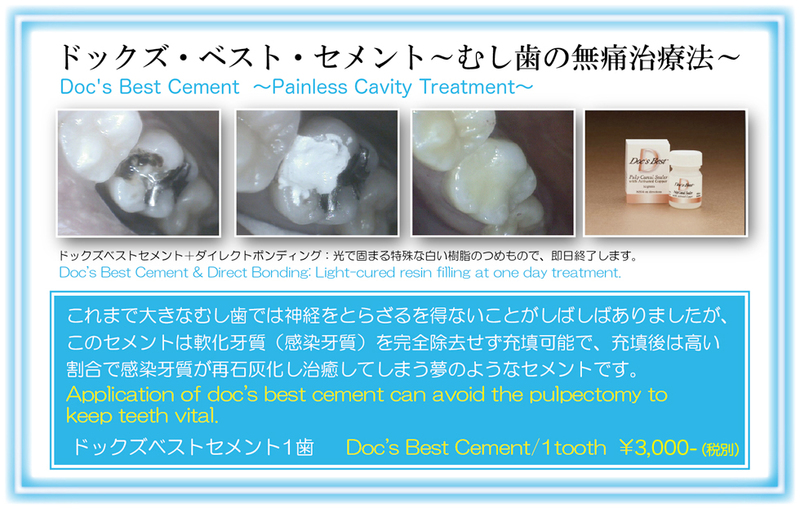 ・Pain control, hemostasis, gingivectomy, sulcular debridment etc. 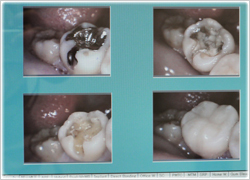 Application of Doc's Best Cement can avoid the pulpectomy to keep teeth vital.